The Marvel Cinematic Universe’s depiction of Wakanda is undoubtedly going to become the definitive take on the secretive nation for many people once Black Panther hits theaters, and that’s understandable. But there is so much more to Wakanda’s rich history in the comics that just won’t fit into the film. Marvel’s become very good at distilling down the histories of its characters to fit neatly within the MCU, but unlike most of his fellow heroes, the Black Panther and his homeland have been almost entirely off the map. If you want to go into Black Panther knowing a bit more about Wakanda’s canonical history, there are a few key moments from various comics spanning back over 50 years. Note: Though this isn’t the exact order some of these moments were published over the years, this is still the chronological order in which they all occurred. Though it’s fairly common knowledge that T’Challa and the people of Wakanda were first introduced in Fantastic Four #52, it’s worth remembering the specific circumstances of this debut. When T’Challa lures the Fantastic Four into a battle, he’s making the conscious decision to open himself and Wakanda to the world for the first time. What’s more, he does so specifically because he wants to test himself and see whether he’s ready to fight Ulysses Klaw. It’s significant that T’Challa would essentially enlist the assistance of the outside world in order to handle a deeply personal problem like Klaw, because such a move goes against Wakanda’s tradition of isolationism. But this was the first of many things T’Challa would do to establish that he’s a very different kind of Black Panther then his predecessors—and that he has his own ideas about how best to protect Wakanda. After becoming acquainted with the Fantastic Four, T’Challa was introduced into the wider world of costumed superheroes. Soon, he found himself being welcomed into the Avengers’ ranks as its newest (and first black) member in Avengers #52. T’Challa’s duties as an Avenger would soon become almost as important as his responsibilities as a king, and the duality of his separate lives would further illustrate the differences between his and his father’s time spent as the Panther. In addition to pulling T’Challa away from his throne (though he was almost always more than willing to go), his involvement with the American superhero team would eventually lead to him revealing his secret identity to the world, further increasing the amount of attention being paid to Wakanda. After spending a sizable time away from Wakanda, T’Challa returns home to find it under attack from Erik Killmonger (played by Michael B. Jordan in the film), a would-be usurper who T’Challa is eventually able to defeat. But Killmonger’s initial defeat would drive the villain to return years later with a plan to wreak havoc on Wakanda’s economy and plunge the country into chaos. It’s around this same time that Everett K. Ross and T’Challa begin their longstanding professional relationship and Ross is temporarily appointed to be T’Challa’s regent on the throne. Killmonger’s challenge to T’Challa’s rule culminates in a traditional ritualistic battle between the two that Killmnger wins, making him the new Black Panther and technically the leader of Wakanda. While a comatose T’Challa wanders through the spirit realm alongside the Moon Knight, Killmonger takes T’Challa’s place in the Avengers, much to the disdain of the other members. In time, T’Challa awakes from his coma and spends time in New York City where he mentors young police officer Kasper Cole. In an attempt to gain access to Wakanda’s vibranium, the US government allows Klaw to form a team of supervillains—including Batroc the Leaper, the Black Knight, Radioactive Man, and Rhino—who lead an attack on the African country. The US plans to offer its “assistance” to Wakanda by deploying fleets of Deathlok cyborgs that were intended to become permanent installations, even after Klaw’s team was defeated. T’Challa recognizes the ploy for what it is and summarily dismisses the Deathloks with a warning to the US. Not long after defeating the Deathloks, T’Challa marries Storm and sides with Captain America and those who oppose the Superhuman Registration Act at the center of the first superhero Civil War. When T’Challa turns down Namor’s offer to join his cabal of supervillians who are trying to take over the world, Doctor Doom retaliates by putting the Wakandan king in yet another coma, which prompts the royal family to search for a new leader. As next in line for the throne, Shuri steps up to the plate and sets off on her own journey to find the heart-shaped herb and commune with the Panther god. As a result of his coma, T’Challa loses all of his mystically-endowed powers and spends some time in Hell’s Kitchen where he operates as Matt Murdock’s replacement for some time while Shuri rules Wakanda. During the events of Avengers vs. X-Men, Wakanda is destroyed by a Phoenix-empowered Namor who summons a massive tidal wave that levels most of the capitol city. T’Challa rightfully blames the Phoenix and the mutants for the devastation in his country and it drives him to ultimately nullify his marriage to Storm. T’Challa is one of the few beings in the universe who survives the series of Incursions that occur in the months leading up to Marvel’s second Secret Wars event that destroys most of the Multiverse. T’Challa and the other survivors of the original universe realize that they’re the last line of defense to take down Doctor Doom, who reshaped what remained of the Multiverse into a twisted Battleworld where he ruled as an all-powerful god king. T’Challa successfully leads an army of superpowered zombies on Doom’s fortress, which allows for the resistance spread across Battleworld to cut Doom off from his power source. At the end of the Secret Wars event, T’Challa uses the Time Gem to presumably remember the events of the previous timeline that was erased and re-written. He resolves to push Wakanda into the future by beginning the country’s space program. 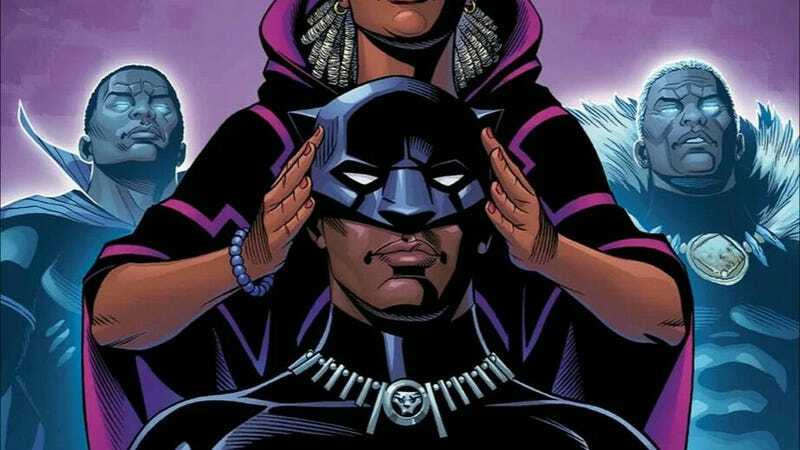 Most recently, Wakanda’s been steeped in yet another round of political turmoil after the events of Civil War II left Shuri in a psychic and spiritual limbo, requiring T’Challa to return to the throne. T’Challa’s return came at a time when many Wakandans were beginning to question the strength and authority of the throne and a new desire for democracy was beginning to gain steam across the country. As a group of Wakandan insurgents called the People began to agitate for social revolution with a number of extremist tactics, the Dora Milaje took the stance that T’Challa had abandoned his people—something that drove many of the Doras to turn their back on the throne as well. Though T’Challa was ultimately able to expose the People’s nefarious intentions, he also decided to move forward with the founding of a Wakandan constitution, which is likely to lead to the formation of a new Wakandan democratic government.